If you're looking for business or leisure Houston hotels near IAH Airport that provide southern hospitality and a great value, welcome to our Houston hotel. With great access to the George Bush Intercontinental Airport, guests enjoy a superior location and competitive rates along with the best in service. The Best Western in Houston is known for dishing up plenty of southern hospitality, fantastic amenities and luxury bedding. You'll be within driving distance to most major attractions and conveniently situated near shopping and dining options. 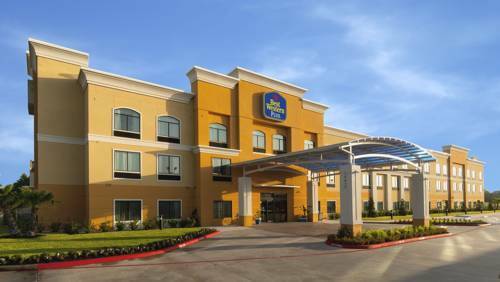 This Best Western is by the George Bush Intercontinental Airport and offers a free 24-hour airport shuttle service, (please contact hotel for pickup). Easy access to all major freeways makes commuting for business travelers a breeze. A few of the regular guests at our Houston hotel include employees of Siemens, Baker Hughes Halliburton and General Electric . There's plenty of time to sleep in when you're just a short drive from your meeting. Your Best Western Plus JFK Inn & Suites is near the Golf Club of Houston, at only seven miles away. Downtown Houston is 15 miles away and the Houston Museum District is 19 miles from our Houston hotel. Whether you want to spend the day on the links, enjoy some culture or explore everything the city has to offer, it's all readily available. The Reliant Stadium Complex is 30 miles away and a top destination for many of our Houston hotel guests. Our proximity to major corporations in the Greenspoint Business District is also a big reason why many guests choose to stay with us. Relax in your spacious, cool room and rest assured that any place you need to be is only a few minutes away. If our staff can help make your trip better or easier, just let us know. We pride ourselves on always going the extra mile. Reserve your next stay at the Best Western Plus JFK Inn & Suites for a stress free trip! Enjoy your stay! From: Interstate 10 / 610 West. Exit I-45 North to Beltway 8 East to John F. Kennedy Boulevard North and the Best Western Plus JFK Inn & Suites. From: Sam Houston Tollway. Exit Beltway 8 East to John F. Kennedy Boulevard North and the Best Western Plus JFK Inn & Suites. From: Bush Airport. Follow Interstate 45 South and exit at the airport facility which will continue to John F. Kennedy Boulevard for approximately three miles until you reach the Best Western Plus JFK Inn & Suites. 30.00 mile(s) from Reliant Stadium, Houston Texans NFL football, annual Houston Livestock and Rodeo. 29.70 mile(s) from San Jacinto State Park, home of Battleship Texas. Historical site.